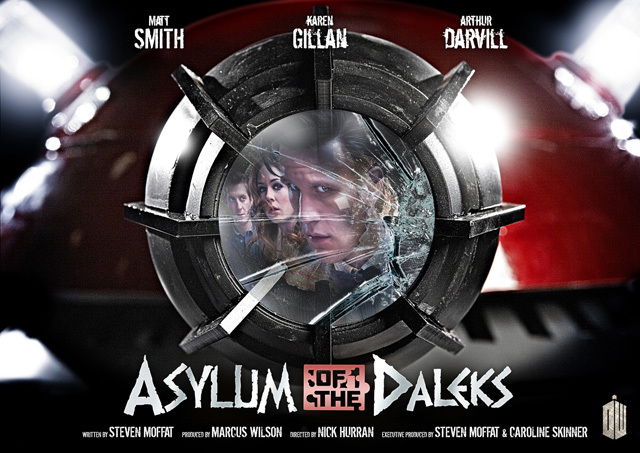 Doctor Who: The Moffat Scripts – ASYLUM OF THE DALEKS | Warped Factor - Words in the Key of Geek. Dr. Moo is not a Dalek! Steven Moffat gave himself a breif: To make the Daleks scary again. What followed was what the lovely visitors to our site voted as the number four greatest Dalek story ever as of 2014 (though there have been two more Dalek adventures since then). When you watch Asylum of the Daleks it’s not hard to see why it fared so well in the poll. 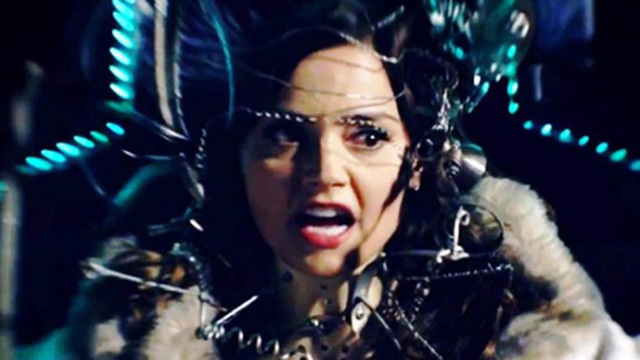 This story is filled to bursting with fan-pleasers from the surprise early debut of Jenna Coleman (still credited at this point as Jenna-Louise but I just can’t bring myself to call her that), to the fact that the Daleks are actually scary for a change, to the return to on-screen Who of Skaro, to the much-promoted inclusion of every Dalek ever, to the simple fact that unlike the last Who episode to be broadcast it was actually good! There are some issues that for me hold it back from quite achieving its full potential and do make me question its top four status but overall this is a solid start to the seventh series. 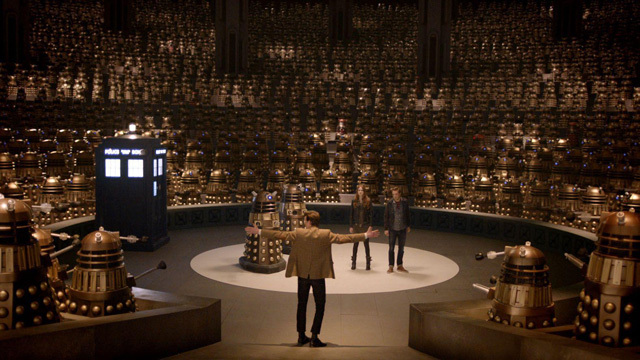 One such thing is the concept of the Daleks having a parliament – since when??? Why would a species that’s built upon fascist ideals want to engage in a democratic system? Similarly why do they have an asylum given that Daleks have always been prone to simply killing other Daleks that fail to meet what’s needed of them (even in Victory of the Daleks, their most recent appearance before this one)? We need to throw these logical inconsistencies out the window if we’re to have a story here, so by all means do that. Thirdly, why do the Daleks seek out the Doctor to do their dirty work for them? Isn’t he supposed to be their ultimate foe? This very story establishes that the Daleks literally know the Doctor as The Predator because of how many times he’s defeated them – why are they asking HIM for help??? One final issue that I take with Asylum of the Daleks is Amy and Rory. I mentioned briefly in my retrospective two weeks back on The Wedding of River Song that I felt that was where their story should’ve ended and that throughout series 7 their presence is fairly redundant, like treading water before the fateful trip to Manhattan, and from the way they’re reintroduced here the evidence is strongly supportive of that I’m right. At the beginning of this story we see Amy pushing for a divorce from Rory (which flies in the face of everything that’s gone before) because she can’t have kids after Demons Run… for some reason. Yet the last time we saw her in The Doctor, the Widow and the Wardrobe it’s established that they’re still together at least two years after that happened, so I don’t buy that explanation. I think that Moffat was just looking for some way to add an additional conflict to the story. At least in Karen Gillan and Arthur Darvill we have a pair of performers you can always count on to do a good job and they don’t disappoint, it’s just a shame that they’re lumbered with such a non-starter of a subplot. Given that divorce rates are sadly at an all time high and there’s a large number of children that watch the show who will have their parents sadly go through one I think it’s good to address the issue but by the end it’s all swept away under the rug and never heard or thought of again – not a realistic outcome, even if the separating couple do help defeat a mob of angry Daleks. This is supposed to be a story about the Daleks and the fan-service of having tonnes of them, so why throw in such a subplot as that if you’re going to completely ignore it??? But if we ignore these petty nitpicky problems we have a decent adventure that certainly does make the Daleks scary again, and much of the credit for that lies with the perfectly judged direction of Nick Hurran. He manages to craft some nice moments inside the Asylum Planet with the lighting being just that little bit too low so that the Daleks are shrouded in darkness, you notice it when they activate thanks to the lights on their heads… and it’s scary. He puts together a neat little moment with Amy walking into a room filled with people dancing or talking and a blurry camera style, and suddenly pulls back to reveal that EVERY SINGLE PERSON AMY SEES IS ACTUALLY A DALEK. Those are just two standout moments but there are many many more. This is one of five Doctor Who episodes that he’s directed and I for one want to see him add to that list. Bring Hurran back please! I didn’t expect that, hands up who expected that. No, I’m not crying. You’re crying! Shut up! Can we just take a moment to applaud both Coleman and Nicholas Briggs (GET HIM TO WRITE FOR THE TV SERIES!!!) for their acting here because this is some of the best in the entire history of Doctor Who. The emotion Nick puts into the voice of the Dalek – “They hate you so much. Why?” – and how he mirrors Jenna’s speech patterns is phenomenal, and the way she portrays the subtleties of fear, anger and sadness while fighting off the Dalek instincts… breathtaking. Matt’s pretty good too, reacting to just a prop, but Matt Smith is always so good as the Doctor that it really goes without saying. It’s the role he was born to play and I can’t praise his performance enough. Watching Asylum of the Daleks again today, with the knowledge of how Clara’s story progresses and how it ends, is a strange sensation. She says to the Doctor “Run you clever boy and remember” and watching in 2016 we know that there will come a time when he forgets her forever (or at least until she returns in the 60th anniversary special – you heard it here first) but always keeps on running. Clara’s story is a sad one filled with loss and heartbreak and deaths and lies and it all, in a timey-wimey sense, starts right here. Yet this works well as a standalone story too. In that sense it serves as a great jumping-on point for new fans (I know a few who can testify to that). There are a few things that hold it back from achieving its full potential and with a few minor tweaks it could be one of the greatest Doctor Who stories of all time… but it isn’t. However as a story to kick off the fiftieth anniversary season in style you could do a lot worse than this: with its perfect blend of scares and excitement, just the right amount of fan service and some of the greatest acting in Doctor Who history, Asylum of the Daleks is a fantastic episode and it is well worth getting out your series seven boxset for another chance to watch it.